Once upon a time three little pigs decided to build their own homes. But the big bad wolf is lurking and will do whatever he can to have them for a meal! Sound familiar? Of course it does but there is something different in this retelling of storybook classic The Three Little Pigs. These little pigs are creative, with a flair for architecture and design. 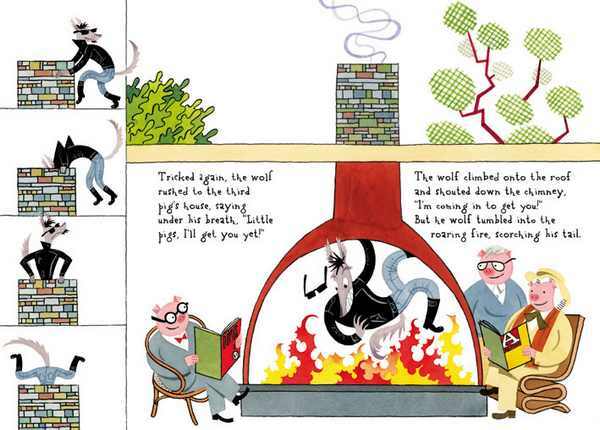 The Three Little Pigs – An Architectural Tale by Steven Guarnaccia uses famous architects and their contemporaries to give a classic story a distinctly modern and stylish edge. Guarnaccia has turned the little pigs into Frank Gehry, Philip Johnson and Frank Lloyd Wright. 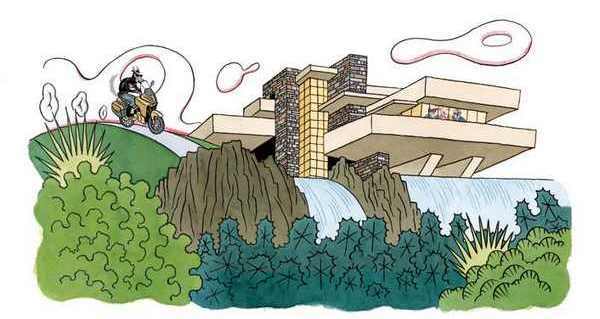 Piggy Gehry lives in a house of scraps, Piggy Johnson lives in a house of glass and Piggy Lloyd Wright builds his of stone and concrete – and it looks remarkably like Fallingwater. Of course, not all the houses are going to protect the pigs from the wolf’s huffing and puffing. But when one of the houses holds up, it’s the wolf – portrayed as a cool biker – who’s in for a surprise ending. The story has some additional elements compared to the original tale but they work well and as a result the wolf does not meet such a gruesome end. Highlights are on every page – play spot the modern design icon. There are all sorts of designer artefacts furnishing the pigs’ homes from chairs and tables to coffee pots and lamps. There are also other iconic buildings referenced throughout, including our very own Sydney Opera House. Helpfully, the end papers include a glossary of all the renowned designs used in the book. This is the perfect book for kids with design-conscious parents – the whole family can have fun playing spot the Starck or Le Corbusier. Clever little piggies can then get busy working on their Lego Fallingwater. 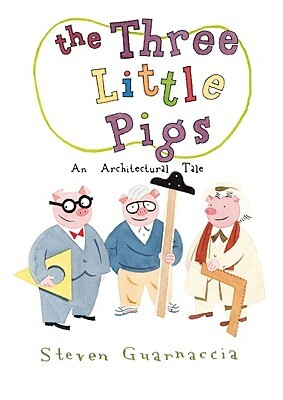 The Three Little Pigs – An Architectural Tale is available from Fishpond for $19.95. Thanks to Babyology reader Sam for pointing this one out to me.